Cinnamon Cooney, known as The Art Sherpa, excels at communicating her unique painting style through her YouTube video series. 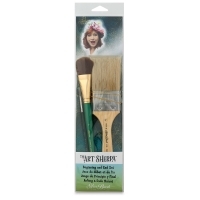 Created to accompany The Art Sherpa painting videos, Silver Brush Art Sherpa Brush Sets work with heavy body acrylics, plus fluid and soft body media. 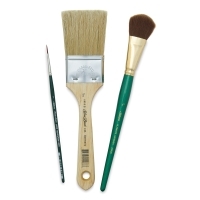 For background painting, light touch varnishing, and both soft and heavy body acrylics, this set includes three short handle brushes, one each of 2" Wide Blender, Size 1 Ruby Satin Liner, and 1" Ultimate Varnish. The Liner is great for adding details and, at the very "end" of your painting session, your signature! ® Silver Brush is a registered trademark.™ Art Sherpa is a trademark. ® Ruby Satin is a registered trademark. ® Stencil Mini is a registered trademark.